Colour is an essential part of architecture and design and selling. A thorough knowledge of colour improves the quality of work and gives greater job satisfaction. There is no easy or quick way to acquire knowledge about colour. NCS courses and study material make the learning process straightforward and memorable. 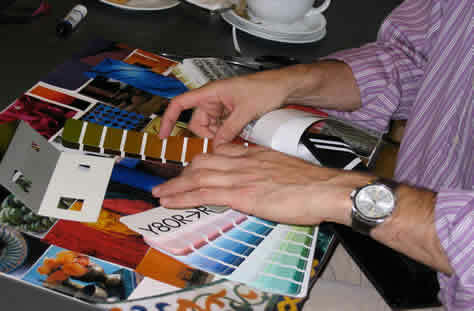 Our two day workshop style colour course runs on consecutive days. Extra dates can be added if required. The workshops can also be customised to be run in house. Both days run from 9am to 5pm and include practical exercises, demonstrations and discussions. The second day depends on knowledge gained in the first. No prior knowledge or training is required, but we ask all delegates to complete the online 'Introduction to colour specification' before attending. The course is run in June each year and costs £725 plus VAT per person. Includes lunch, refreshments, course materials and course notes. The course can be run for groups at other times by arrangement. River & Rowing Museum, Mill Meadows, Henley-on-Thames. • Communicate more easily and accurately about colour with clients, suppliers and colleagues. • Specify colour more precisely and knowledgeably. • Understand colour perception and improve your skills in making colour judgments. • Work more easily between NCS and other colour systems such as BS, RAL, Pantone, CMYK and RGB. • Awareness of metamerism and the effects of light on colour. • Creating colour combinations and colour palettes. • Inspiration, research, trends and forecasting and also discusses colour psychology. Marilyn Sturgeon, director of NCS UK and colour expert. Designers, architects, marketing, manufacturing, teachers and others who want to gain or improve their colour skills. A maximum of six people allows for individual advice and help with practical exercises. No prior knowledge or training is required, but we ask everyone taking part to complete the online introduction to colour specification before attending the full day workshops. Please contact us on 01491 411717 or email info@ncscolour.co.uk. Go to NCS Product Guide for details on products.